If you are looking for a beautiful, safe, and family-friendly neighbourhood, dive into the culture of Greenbrier, a community located at the north end of the city of Brantford, Ontario. This neighbourhood is thriving with chic homes, energetic individuals, and beautiful scenery, all waiting to be discovered by eager homebuyers. Conveniently located close to schools, parks, shopping, restaurants and highway access. Take the children to Greenbrier Park, a spacious and open area with soccer fields, a baseball diamond, and an ice skating rink that are sure to delight them. 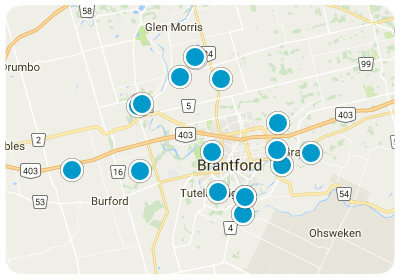 This beautiful suburb keeps all its residents in touch with the activities and conveniences of Brantford. Round up your friends and take the short drive to the Wayne Gretzky Sports Center indoor complex, where locals can choose from a wide range of activities, including swimming pools, hockey arenas, exercise rooms, and fitness classes. Enjoy local coffee shops, restaurants, shopping, grocery stores, Galaxy Cinemas movie theatre, and more. With an approximate population of 7,000, the Greenbrier community is a network of streets lined with charming single-family homes and a large residential area where families love to live. There are a variety of different real estate options to choose from, including unique sizes and styles, sure to please any homebuyer looking in the area. Not only is Greenbrier a wonderful community in a beautiful and charming part of town, but a variety of newer construction can also be found in the neighbourhood. Anywhere between 1,000 and 3,500 square feet of space, these single-family homes in Greenbrier are just as spacious as they are beautiful. All in all, Greenbrier is the perfect community for homebuyers interested in a friendly, safe, and dependable neighbourhood, as it’s dynamic and family-orientated culture will surely charm all those who visit. If you would like more information regarding homes for sale in Greenbrier, please allow us to assist you and contact us today.